Profoto Air Remote TTL-S for Sony | Beau Photo Supplies Inc.
Attaching the Profoto Air Remote TTL-S to your Sony camera’s hot shoe integrates your camera to the Profoto AirTTL flash system. In TTL Mode, you just point and shoot, and the Air Remote TTL-S will communicate with the flash to automatically give you a perfect exposure. It is as easy as it sounds. If you prefer more precise control, switch to Hybrid Mode. This allows you to first shoot with TTL to get the correct exposure, and then switch to Manual Mode with the same readings and settings and do whatever creative adjustments you feel like doing. It is a huge time saver. Comes with patent-pending Profoto High-speed Sync technology – faster, more powerful and more consistent than any other HSS solution on the market. Sync / Trigger: Yes, triggers Air Remote &, Air Sync transceivers plus all Profoto flashes with AirS, Air or AirTTL support. TTL control: Yes, TTL group control for all Profoto flashes with AirTTL support. 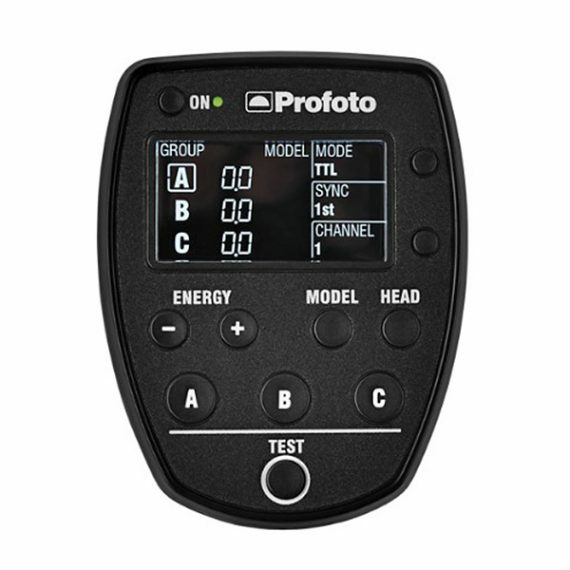 Remote control: Yes, remote/group control for all Profoto flashes with Air or AirTTL support.